This dish is on my top ten most crave-able food list as well as being one of my cousin, Hiep’s favorites. His last response to my texting him a photo of the pot of chicken and dumplings I had stewing, “So, are you going to share the dumpling recipe or continue to torture me?” Alright! Alright! Here you go, Hiep. I’ve experimented with several renditions of this classic over the years. The recipe below is by far my favorite one. This take elevates the standard boring chicken, gravy with oftentimes too gooey dough that passes as chicken and dumplings. 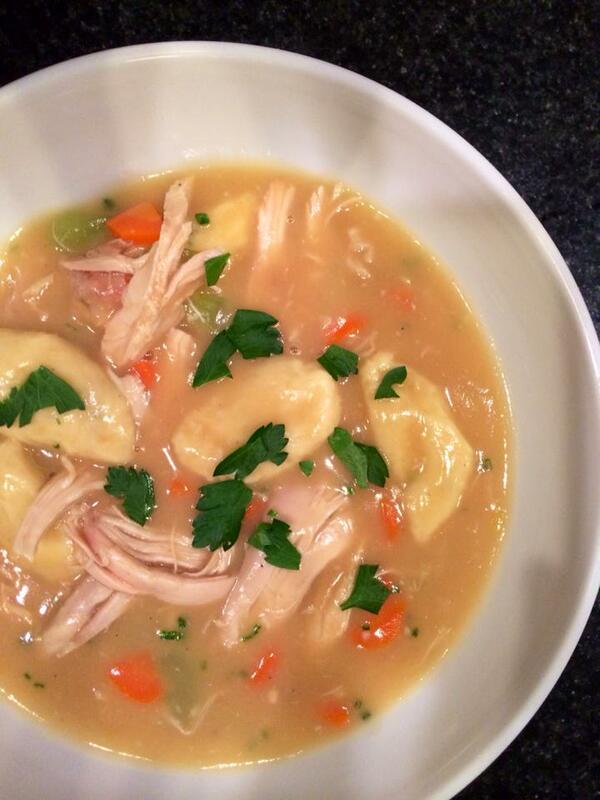 It’s based on Thomas Keller’s Ad Hoc Chicken and Dumplings Soup. I’ve changed the the proportions of the ingredients so that it has a thick gravy rather than a soup base and is heartier overall, but retained the flavors. Why mess too much with a master’s recipe? I usually roast a large organic chicken in the morning, serve the legs for lunch and save the rest for this recipe. The best, easiest and most versatile roast chicken recipe is the Thomas Keller one posted here. Do use the best chicken stock you can get if you’re not going to make it yourself. I like Pacific Organic and surprisingly the Costco Kirkland Organic Chicken Stock is good. Also, I’d keep Wondra flour on hand in case you like your gravy even thicker than I do and extra stock in case the opposite is true. Shredded meat from one medium roasted chicken, homemade or store-bought. Reserve bones and skin for gravy. This entry was posted in Cooking and tagged Chicken, chicken and dumplings, dumplings, homemade, Meat, Poultry, recipe, Thomas Keller, Yummy on July 24, 2014 by friedchickenanonymous. My early childhood was spent in Grenoble, France, where dinner at my parents’ friends house happened weekly. Our friend Marie-France’s specialty was Poulet a l’Estragon (Tarragon Chicken): a whole cut up chicken, braised in a mixture of bacon, crème fraiche, white wine and tarragon. It was a childhood favorite of mine. 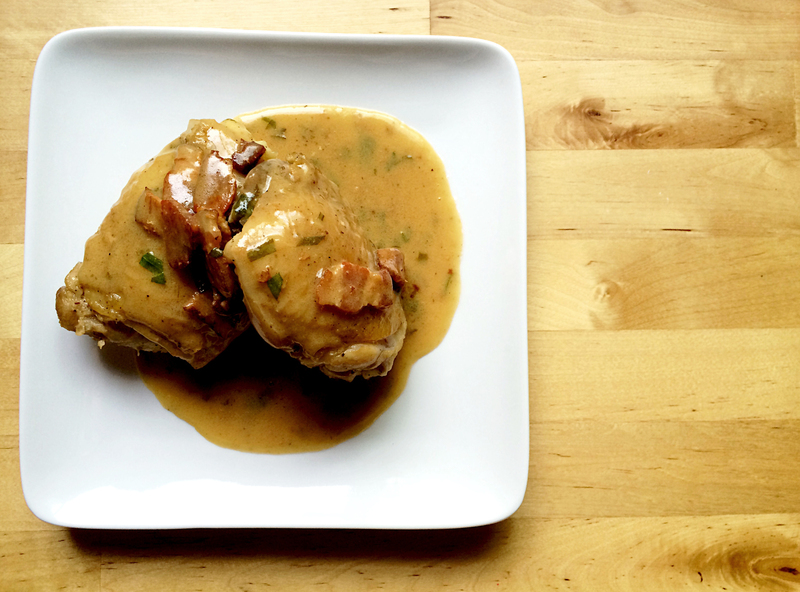 Who can resist creamy, bacon-ey chicken? Last week, my cousin, Michelle, asked me for a new way to cook chicken thighs. I modified the original tarragon chicken recipe to be less fatty and yet retain the strong chicken flavor that you get from braising a whole bird. If you’d like to cook a whole cut-up chicken the way Marie-France used to make it, modify the recipe below by adding 3 slices of bacon, adjusting the wine to 1 1/2 cup, changing the crème fraiche/cream to 2 cups and no chicken broth. Since there’s so much cream in the whole chicken version of the recipe, making a roux to thicken the sauce is unnecessary. I reduce my chicken broth to about 2/3. I like my tarragon chicken with a little rice one the side and french bread. Bon appétit! In Dutch oven, cook bacon over medium heat until crispy. Transfer bacon to paper towel lined plate to absorb fat. Brown chicken (no salt and pepper, bacon will add salt to dish) in bacon fat over medium-high heat. Remove chicken from pot and discard all fat. Add cream, tarragon, chicken broth, chicken and bacon to pot, braise covered at a low simmer for 25-30 minutes or until chicken is cooked through, turning chicken halfway through cooking. Remove thighs from pot and pour sauce into a heat safe dish. Melt butter in pan over medium-high heat. Add flour and stir to combine. Cook roux, stirring the entire time until it is lightly colored, 2-5 minutes. Add reserved sauce and cook for 2-3 minutes over medium heat until sauce is thickened. Re-season with salt and pepper and a dash or two of Champagne vinegar as needed. Add chicken back to pot to reheat. This entry was posted in Cooking and tagged Chicken, chicken broth, chicken thighs, Cook, Cooking, crème fraiche, cup crème fraiche, family recipe, french, French cuisine, Home, homemade, Tarragon, Tarragon Chicken on April 25, 2014 by friedchickenanonymous. David Chang is out to torture us! We were glued to the screen as Chef Chang heartily slurped away through bowl after bowl of ramen on Mind of a Chef (season 1). His unabashed enthusiasm and his bliss inspired envy in our bellies and watered our mouths. 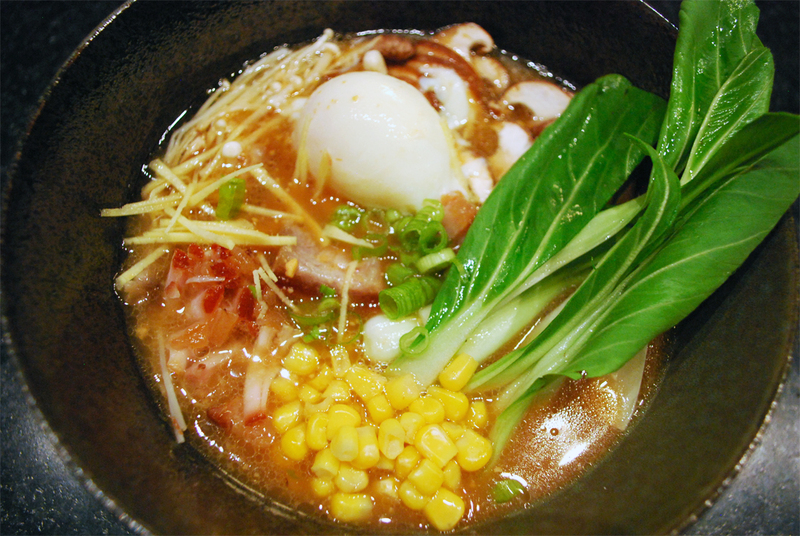 With each episode featuring this hot, delicious Japanese noodle soup, our craving grew stronger. Having no ramen joint in Tucson, I was left with no choice but to concoct my own bowl. I drove myself to the local Asian market to buy ingredients to make a pot of my own. My intention was to make the Momofuku broth, but, on this particular grocery run, they had run out of chicken backs. So, I improvised the recipe below based on what was available: pig feet and pork necks. Miso was added for umami and bacon at the very end for a distinct smokiness. I used kombu and dried shiitake to layer the flavors and a combination vegetables to deepen the broth. I waited until the end to taste, season, add to and refine the broth with what I had on hand. Goodness ensued. This is our favorite homemade broth thus far. Fresh ramen noodles are non-existent at Asian grocers in Tucson, so made my own (see link for recipe). I’ve tried substituting Chinese wonton style noodles before. They’re too thin and soft and don’t quite have that bite. If you can find it, a suitable substitute for homemade are the noodles from refrigerated ramen packages. They usually come with their own broth seasoning. Just toss the seasoning and boil the noodles according to package directions and use with your broth. Making ramen is a time consuming process, but, a satisfying one. So, if you haven’t watched Mind of a Chef, I recommend watching it on Netflix while your broth is stewing away. It’s inspiring, funny and entertaining. Before starting broth, do steps 1 in ramen noodle recipe, so your dough has time to rest. Let it rest at least 4 hours, preferably overnight before rolling out and cutting. I also start cooking the Charshu pork while the broth is simmering (step 10 below). In a rimmed cookie sheet, place pork bones in one layer. Roast for 30 minutes. While bones are roasting, fill 10 quart pot ¾ of the way full with water. Add kombu and bring to a boil. Turn off heat and let flavor steep for 10 minutes. Remove and discard kombu. Add dried shiitake mushrooms to pot, bring back to a simmer and cook for 30 minutes. Add bones and fond from cookie sheet to pot and bring to a simmer. I deglaze fond with a couple ladles of the hot cooking liquid. Roast onions, leek and scallion in pan or over stove until lightly charred and add to broth. Cover and simmer for 2 hours. Remove vegetables and strain liquids into a bowl by pressing pieces through a strainer. Pour liquid back into pot. Discard vegetables. Cover and simmer for additional 4-6 hours. Add bacon, boil for 30 minutes, uncovered. Season with ¼ to 1 cup of liquid from Chashu Pork and 2-5 Tbsp. of miso according to taste. Add a little of each at a time, let the flavors blend for a minute or 2, then taste. Boil ramen noodles for 1-2 minutes until al-dente, strain and add to bowl. Layer your choice of garnishes. Pour boiling broth over and serve. This entry was posted in Cooking and tagged asian, bok choy, Broth, Chashu, Cook, David Chang, eggs, Enokitake, green onions, homemade, japanese food, Miso, Momofuku, Netflix, noodle soup, noodles, ramen, shiitake, soup, tonkotsu on November 12, 2013 by friedchickenanonymous. Banh Mi in Vietnamese translates to bread. Just bread. But, we’ve all come to associate it with Vietnamese sandwiches. A concoction of your choice of meat with pickled daikon and carrots, crispy cucumber and fresh cilantro. So, Banh Mi Tacos (Bread Taco) should really be called Banh Tacos. Potato, po-ta-toh. Whatever you choose to call it, it’s delicious! This recipe came out of a happy accident. We were making regular Banh Mis and ran out of baguette, but, had a bag of small tortillas. I’m sure someone, somewhere must’ve of thought of this before, however, this was a revelation to us. And it turns out we prefer the taco versions to the standard Banh Mis. There’s a higher filling to starch ratio which makes for a more satisfying, chock-full-of flavor bite. The Char siu (Chinese BBQ pork) in this recipe will not be red as you would expect from your Chinese restaurant. That hot pink color comes from red dye which I’ve chosen to omit. It taste yummy just the same! The pork does need to marinate overnight, so plan ahead. And the pickling of the vegetables should be done the night before as well. Though I’ve done it 3 hours before serving with success. Use a sharp blade when it comes to julienning the veggies, it makes a difference in the texture. If daikon is not available, substitute with five thinly sliced radishes. Trim tenderloin of any silverskin. Add to marinade and refrigerate overnight. In a bowl, mix carrots and daikon with 1-2 Tbsp. salt. Let sit for 10 minutes, this will draw out their liquid. In a container with an airtight lid mix pickling juice ingredients until all is dissolved. Rinse carrots and daikon to remove salt. Dry with paper towels. Add vegetables to pickling juice and refrigerate. Pickles should keep for at least a month. When you are ready to cook pork, remove tenderloin from marinade and set aside, reserving marinade. Mix honey with 2 Tbsp of pork marinade and brush tenderloin with mixture. Pork can be grill or roasted. To grill, turn grill to high. Grill tenderloin, turning every 3 minutes (covering in between turns) until internal temperature reaches 155 degrees. To roast. Turn oven to high broil (500 degrees), broil in oven proof dish for 15-20 minutes, turning every 5-10 minutes until internal temperature reaches 155 degrees. Let tenderloin rest for 20 minutes before slicing for sandwiches. Warm tortillas on stove, in a pan. 30 seconds each side over high heat. Wrap warmed shells aside in a clean towel until ready to use. On each tortilla, run a bead of mayo and Siracha (optional) down the center. Top with slices of pork. Sprinkle pork with Maggi seasoning. Add a layer of sliced cucumber. Top with a little pickled vegetable. Pepper and top with jalapeno (optional). This entry was posted in Cooking and tagged Bánh mì, Char siu, Cook, Daikon, homemade, Pickling, Pork, sandwich, Tablespoon, Tortilla on November 10, 2013 by friedchickenanonymous. I’ve been trying to get in the habit of using up fresh foods in my kitchen before they go bad. A self-inflicted Iron Chef challenge. “Allez cuisine!” I found that it’s been a great way to challenge and expand my culinary skills. Today, my ‘secret’ ingredients were one ripe peach and a stalk of rhubarb. Really not enough fruit to make much of anything. But, luckily, I had a partial bag of frozen organic blueberries leftover from our Saturday morning pancakes too. Taking inspiration from my friend, new mother and pastry chef, Sarah and a couple of blogs about galettes, I came up with the recipe below. Sarah was sweet enough to give me some pointers (that I noted in my recipe) after I tasted and became enamored with her ginger peach galette. Her pastry was a perfectly flaky, tender crust filled with slightly sweetened, spiced slices of peach with subtle bits of candied ginger interspersed throughout. The ginger and pepper elements in the recipe below are a take on her version as is finishing with the tart with turbinado sugar (aka sugar in the raw) to give it a little spark. Lining the bottom of the galette with the almond meal mixture was influenced by the Rhubarb Galette recipe at Tasting Table. I liked the idea of bringing a nutty flavor in and keeping the bottom of the galette from getting soggy. I chose to incorporate the ginger in this layer of the pie as well. It’s less sticky to chop candied ginger into a flour/almond meal mixture than by itself. The crust/pate brisée is an adaptation of several recipes and their techniques. I’ve struggled with making the perfect pie/tart crust for years and am finally coming close to mastering it. The Cook’s Illustrated recipe in the The Science of Good Cooking, The Food Lab’s post about the Science of Pie Dough and having Sarah video Skype with me while I was making this challenging dough, (Sarah directing, “No, not wet enough!”) has helped me come a long way. I doubt that Sarah is available for the masses via video chat, but, I’d highly suggest you check out the other sources. And I’ve convinced Sarah to let me video her techniques soon. I will share her wisdom! Thankfully, this impromptu galette turned out delicious. Otherwise, this post would’ve been about the galette that might have been. 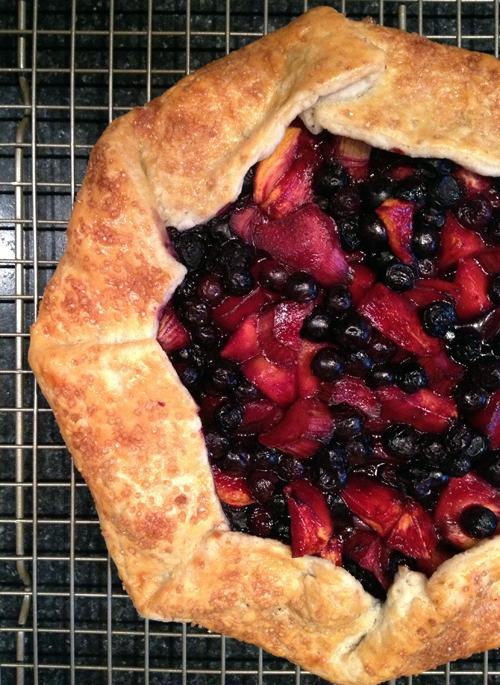 The tart rhubarb was a compliment to the mellow berry flavor of the blueberry and peach. The ginger added a nice spice and the almond meal a subtle nuttiness. I’ll be making it this new recipe again soon. I hope you’ll enjoy it as much as we did. Plan this part ahead as the dough will at minimum need to rest in the refrigerator for 1 hour. Preferably 2 or more for a tender crust. Sarah rests hers overnight for optimal tenderness. Also, all your fats and liquids should be ice cold. Freeze you butter and shortening as well your vodka. Though the vodka sounds like an odd choice. It’s tasteless and will cook off, but it will not encourage gluten development (like water), so it’s a great way to make the dough more pliable while avoiding the peril of a leathery shell. And the word on the street is work your dough as little as possible for a tender, flaky crust. In your food processor, pulse ½ (4 oz./1 cup) of flour and salt together. Add cold shortening, cubed butter and pulse for a few seconds until only lentil size pieces of fat remain. Add the rest of flour and pulse a couple of times to incorporate. Turn dough over into a large bowl. Sprinkle 2 Tbsp. of ice-cold water and 2 Tbsp. of cold vodka over mixture and fold in with a spatula. If dough is still dry and crumbly, alternately add water and vodka, 1 Tbsp. at a time, gently folding until dough has just come together. Dough should form into a ball easily, but, not be sticky. Shape dough into a round disc, about 1” thick and let rest in fridge for 1-2 hour or overnight. Flour your counter generously and turn out cold dough. A tip from Sarah for unfrayed edges: with the palm of your hand pound the edges of your dough disc. Forcefully pound then turn dough to a new section and work your way 2 to 3 times around. 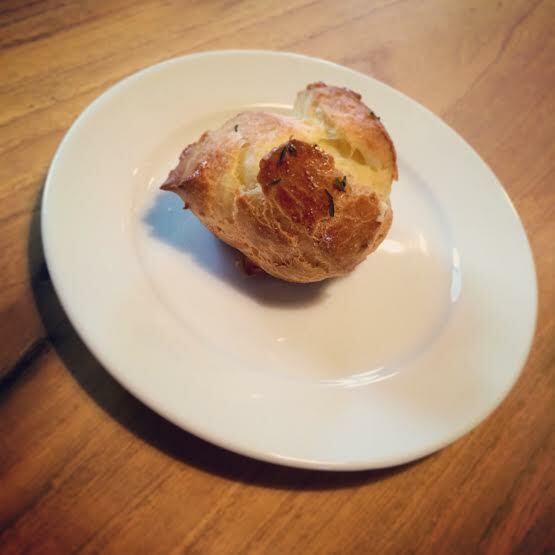 Another Sarah bit of wisdom regarding rolling the dough: roll only in one direction. Going back and forth will overwork your pastry. It’s best to roll gently, turn the dough 1/8 to ¼ turn and repeat until desired thickness and size is achieved. The goal is to gently but quickly roll out dough without too much pressure. This should keep your dough flaky and tender and ensure a rounder shape. When dough is approximately a 13” plus round, trim excess to make a nice circle. I used a 13” pizza pan over my dough and trace around it with a knife. Check and repair any holes or broken edges so that filling doesn’t leak. Place your dough round on a cookie sheet lined with a Silpat or parchment paper. Let rest in fridge while you’re putting together the filling. Preheat oven to 400 degree with one rack on the bottom and one in the middle. If using a Breville Smart Oven, which I did, use bottom rack and bake on the parchment-lined pizza pan provided with oven. On a large cutting board, combine all the ingredients for the almond layer (almond flour, sugar, flour and candied ginger). With a large kitchen knife, chop ginger finely into mixture. Set aside. Place blueberries, peach and rhubarb in a large bowl. Sprinkle the rest of the filing ingredients (sugar, corn starch, salt, cinnamon, fresh pepper, vanilla extract, Chambord and lemon juice) over the fruit and with a spatula gently fold in, so that mixture is evenly incorporated, being careful not to bruise blueberries. Remove crust from fridge. Sprinkle almond mixture evenly on the bottom center of the shell, leaving a 3” edge. Top almond layer with fruit mixture, spreading evenly. To fold in edges of crust: fold, turn 1/8 of the way, and repeat until a nice pleat is achieved or roughly gather edges in for a more rustic look. Generously brush edges with beaten egg, getting wash into folded creases (this will help folds to stay put). Sprinkle exposed galette crust with raw sugar. Bake at 400 degrees for 15 minutes on the lower shelf of your oven to ensure a crispy bottom. Turn oven down to 350, move galette to center rack and bake for an additional 30-45 minutes until crust is golden brown and filling is bubbly. If fruit looks dry on top, use a pastry brush to spread liquid part of filling. Let galette rest for an hour on baking sheet or gently slide pastry over onto to a cooling rack and cool for a crisper bottom. Serve by itself, with fresh whipped cream or ice cream. This entry was posted in Cooking and tagged Almond meal, baking, Blueberry, Cooking, crust, Dessert, french, Galette, Home, homemade, impromptu, iron chef, leftover, peach, peaches, Pie, recipe, rhubarb, Shortening, Silpat, Tablespoon, Tasting Table on August 27, 2013 by friedchickenanonymous.